Sprout: Purplish red, conical, slight hairiness. Stem: medium pigmentation; wings developed undulating. extended (I = 1, 87); limbus: plan. ;] Z Flowers: Abundant. 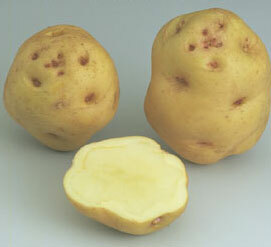 Grading: Proportion of large tubers: very high. Susceptibility to diseases: Leaf blight : sensitive enough. wart: sensitive. Common scab: fairly susceptible.